UHURU KENYATTA: I will talk to Raila Odinga after Election inorder to unite our country. - Bana Kenya News, Real African Network Tubanane. Home News UHURU KENYATTA: I will talk to Raila Odinga after Election inorder to unite our country. UHURU KENYATTA: I will talk to Raila Odinga after Election inorder to unite our country. 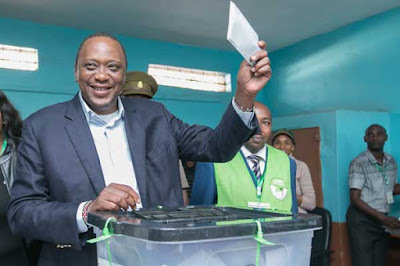 President Uhuru Kenyatta cast his vote at Mutomo Primary School in Gatundu South Constituency where he pleaded with Raila Odinga to decline his move as it will make the country economy declined. The President said that he will out to Raila Odinga after elections to make sure that the country is united. The president urged everyone to vote as it is the constitutional right. The acknowledged the country is grappling with tribalism, even as he reiterated that participating in an election or not is an individual’s right which must be respected. “As a responsible leader you must reach out and that is my intention,” Mr Kenyatta said of the initiative which he said would happen after the elections are done. The Head of State, who was accompanied by First Lady Margaret Kenyatta and his mother Mama Ngina Kenyatta expressed hope that the outcome of this election will bring to an end the political acrimony that has been witnessed in the country in the last few months. “It’s my hope and wishes that the country will move forward after this election,” he said. Mr Ruto expressed confidence of a high voter turnout as he cast his vote in Uasin Gishu County on Thursday. The President also suggested that the Raila Odinga move of transforming NASA to a resistance is very dangerous to the country as the economy will decline for good in the next five years.